We have a minimum of 144pcs per design for custom printing and a minimum of 300pcs per design for contract printing (Example: 144 pieces of white short sleeve t-shirt with front & back print.) Mixing sizes and style is allowed. Sizes 2XL and up are an additional fee. Do you need contract printing or custom printing? Contract printing means that you will provide your own goods. Custom printing means that we will provide the apparel and sell you the garment as one flat rate. Style number, quantity and color of garment: For both custom and contract printing we need to know the style number, quantity, color of the garment and size breakdown. Note: If printing multiple graphics, we need the quantity per graphic / per order to provide you with an accurate estimate. Ink type: We need to know what kind of printing you would like. Example: Plastisol or water base, etc. Label printing: Would you like a size label print on your garment? Print locations: How many print locations will the garment have? Please have orders separated by graphic(s) when bringing in your goods. We cannot receive goods in individual poly bags or any type of packaging. It is your responsibility to have them shipped without, or you must come separate them from the poly bags at your own expense. If garments are not pre-sorted, additional fees may apply. Placing your order is simple. Please be sure to have the following items ready: artwork, work order form, screen printing policy and deposit. We have a minimum of 144pcs per style/color/graphic. (Example: 144 pieces of a basic white short sleeve t-shirt with front & back print.) Mixing sizes is allowed. Keep in mind sizes over 2XL are an additional fee depending on the style. Be sure to submit your work order form. 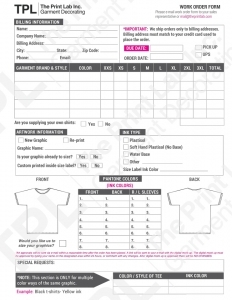 One order form per style.This form will contain all the details of the order, apparel style, color, size breakdown, graphic name, print location, etc. If this form is not submitted we cannot process the order. It also must specify printing technique, pantone color (ink color), and any special requests needed. If you are unsure of a pantone number please refer to our color chart online. Be sure to read our screen printing policy. This is an important document that explains all of our policies in detail. We will email you a copy of our policy with your quote. If you approve the estimate, we will send over an official invoice with all the details of the order. Upon receiving your official invoice you can call or email The Print Lab at mail@theprintlab.com or 818.764.0230 to make your deposit. Once we receive the artwork, work order form, screen printing policy and payment, your order will be considered an official order and will be put on the printing schedule. You will receive a virtual mock up of what your t-shirt is going to look like. The mock up is usually sent after the order has been placed and we have received the goods. It can take from 2-4 business days after everything has been submitted for you to received a mock up. The digital mock-up must be approved or acknowledged with a response within 24 hours. If you do not approve the mock up within 24 hours your order may be delayed. After approvals are signed or consented via e-mail there will be no changes. Note: The Print Lab is not responsible for hindrance on production due to delayed approval of the digital mock- up. Please be sure to check your mock-up for artwork accuracy such as: color, dimensions, spelling and product information. Customers must notify The Print Lab when placing the order if the order will be shipped to a desired location or picked up at our facility. Customers are responsible for all shipping and handling fees (if applicable). All orders are final, if a cancellation is made it must be made within 24 hours of order submission. An order cancellation may be subject to a 20% restocking fee plus a partial payment covering any services already provided. Absolutely NO cancellations will be allowed if the order is already in process or any printing has been done. If your order is a rush there are no changes allowed after your order has been placed. When The Print Lab is providing the garments for your order our minimum is 144 pieces per design. For customer provided garments (contract printing) the minimum order is 300 pieces per design. You can mix and match the style, sizes and garment color, as long as the graphic stays the same. Please note, if printing the same design that requires 2 different sizes (one size for men’s and one size for women’s) this is considered 2 designs. We require a 50% deposit on all orders (NO EXCEPTIONS) and balance due upon completion. If a deposit is not received, the order will NOT be processed. If the order is required to be shipped the balance must be paid prior to shipping. We accept major credit cards Visa, Mastercard and American Express. If order is being shipped, shipping address must match the billing address of the card used to placed the order. All orders MUST be submitted with The Print Lab’s work order form. Orders will NOT be accepted without the work order form. All artwork must be submitted in Illustrator, Photoshop or TIFF format and resolution should be at least 300 dpi. If created in Photoshop please send artwork with layers. If created in Illustrator, make sure text is converted to outlines. We will NOT proceed with the order if artwork is of low resolution or poor quality. If artwork is not sized, we can size it as requested. Please refer to our work order and check the appropriate box to have The Print Lab size your artwork. If artwork requires correcting, an art fee will be billed at $80.00 per hour. Minimum art fee is $80.00. Please provide a digital mock up reflecting desired placement on garment. If you are not able to provide a digital mock up, the art department will provide one. Keep in mind, this may add time for processing. All orders require an approved digital mock up and / or first print photo or physical approval. If a digital mock up is not provided, the art department will provide one via email. Approval is required within 24 hours by typing “approved” in the body of the email within 24 hours, or comment with any changes. If you do not approve the mock up within 24 hours, your order may be delayed. On the scheduled day of production we will send you an email with a digital photo for approval of the first print off the press. Digital photos must be approved within 30 minutes of the photo being sent. After digital photo is approved, there will be no changes. *Note: The Print Lab is not responsible for hindrance on production due to delayed approval of the digital mock-up and or photos. Please be sure to check your mock-up and photo approval for artwork accuracy such as: color, placement, spelling and product information. Changes are limited to the following: Adding additional pieces to the order and changing graphic color. Additional fees and extra production time may be applied (subject to minimums). No changes are allowed once a deposit is taken. Anything added to the order after the order has been processed will be considered a new order and additional fees may apply. All orders are final. If a cancellation is made after an order has been placed, you will be subject to a 20% restocking fee plus a partial payment covering any service already provided . Absolutely NO cancellations will be allowed if the order is already in process or any printing has been done. Note: *If your order is a Rush there are no changes allowed after your order has been processed. We do our best to ensure every garment is printed correctly, but mistakes are inevitable. Customers have 48 hours to inspect and report any damages or defects with the order. Keep in mind we have a 5% damage allowance, we recommend to order additional pieces. The Print Lab is not liable for any garment manufactured inconsistencies including, but not limited to, mislabeled garments, color dye irregularities, stitching errors, rips, tears or holes in garments. The Print Lab is also not liable for inconsistencies in discharge printing due to fabric, dye and/or fabric content. The Print Lab is not responsible if certain items are out of stock. If items are out of stock, we will inform you as soon as possible and offer you alternative styles. Placement: Please be aware that the industry standard is 1/4” tolerance in either direction. This will not be considered a misprint. Our turnaround is usually 7-10 business days. If we are extremely busy, our turn times may vary. Due dates are really important to us. If you have a specific date that you must have your garments in your hands by, please let us know. We do offer a rush service (subject to availability based on current schedule). Please contact us if you need a rush order. 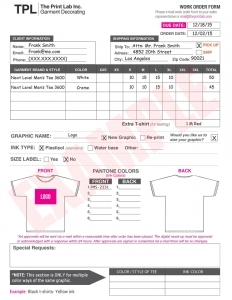 Work Order Form must be filled out with all the details of your order including pantone numbers, garment styles and size breakdown. (For Contract Printing) Goods must be in house,separated by graphic and ready to print. Rush orders are subject to a minimum of $150.00 fee. Additional charges may apply. If you are providing the garments for printing, then you must provide us with a detailed description of the garment, including style number(s), color(s), size(s), quantity and packing slip. The Print Lab requires at least one additional piece per style in each color if needed for testing ink such as (discharge), colors and or printing techniques etc. We are not responsible for the end result of screen printing on the following treatments: Garment dyeing, tie dyeing or special washes made on the garment. We cannot receive goods in individual poly bags or any type of packaging. It is your responsibility to have them shipped without, or you must come separate them from the poly bags at your own expense otherwise additional fees will apply. The Print Lab is not responsible for any delays due to the shipping companies such as UPS, FedEx, USPS and freight carriers. Customers are responsible for all shipping and handling fees (if applicable). Customers must notify us when placing the order if the order will be shipped upon completion. The Print Lab is not responsible for the pick-up, delivery or quantity of goods unless otherwise agreed upon. The Print Lab is not liable for any delay of any portion of the goods covered by this contract due to labor disputes, fire, war, government regulations, weather conditions or any other causes beyond our control. Screens are not for sale. Screens are property of The Print Lab, Inc. Screen fees are for burning and maintenance only. Screens are kept for 6 months of the initial order. After that, screens are reclaimed. If you wish to do a reprint after the six months, you will have to pay screen fees again. *Note: If you have the same design and would like printing in a different area of the garment, it can be considered an additional screen and set up. Pantone color match is available for plastisol, water base and discharge inks. For specific pantone colors in plastisol, water base or discharge color mixing colors will be charged at standard rate of $20.00 per color. 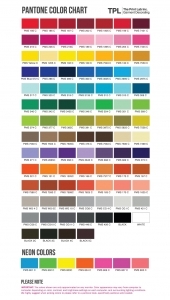 Select a pantone from our free plastisol (only) color chart. Please note that Pantone color mixing is not 100% accurate. The Print Lab has the right to change and alter pricing without notice. We care for our clients and always try to keep our prices competitive and reasonable. Copyright 2019 The Print Lab. All Rights Reserved.